Sophie’s Café is the newest addition to the Metro Central Hotel in Barsha Heights (Tecom). Situated on the ground floor of the hotel, the café specialises in healthy, wholesome food with a specific focus on vegan and vegetarian cuisine. Highlights on the menu include vegan and vegetarian versions of popular traditional breakfast dishes. For example, the delicious ‘vegan breakfast’ which came with home-style beans, sautéed mushrooms, grilled tomato, asparagus, sautéed spinach and avocado. Avocado fans will enjoy the not one, but three different ‘avo on toast’ options on the menu, whilst those with a sweet tooth can try out the various pancakes and French toast dishes on the menu. There’s all the usual health food fare available too – from vegan acai bowls served with banana, strawberries, dragon fruit, peanut butter and homemade granola to chia seed pudding, made with coconut milk, honey and berry compote. Although there are some carnivore options on the menu, this definitely isn’t a breakfast stop for meat lovers (the only two non-vegetarian options on the menu include the ‘eggs benedict’ and the ‘big breakfast’ which both came with veal bacon, and the ‘eggs Atlantic’ which came with smoked salmon. Service at Sophie’s Café was quick and efficient, the staff were friendly, and most importantly could discuss the nuances of the different health food options available on the menu. 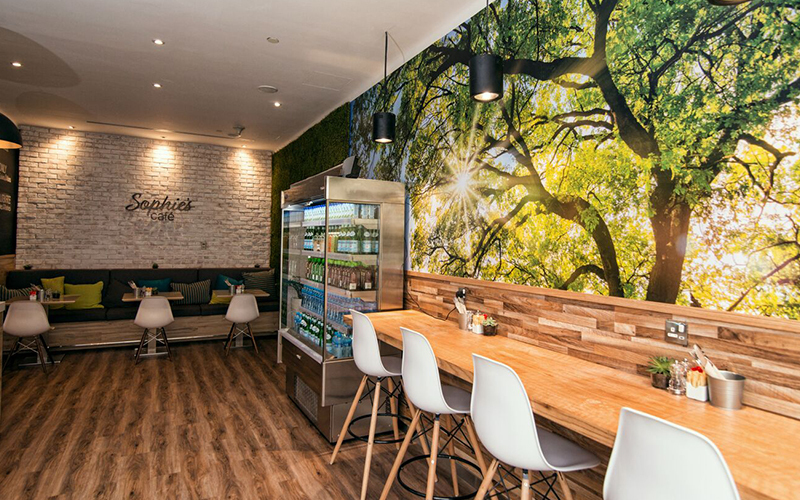 The café is decorated with a green tree print and has an open plan food counter with a blackboard listing the different fresh juice options. Most of the seating is the room next to the cafe, which also overlaps with the hotel’s breakfast buffet area. The best seats can be found in the main café area, whereas the space next door lacks a little in atmosphere. When BBC Good Food Middle East visited on a Saturday morning, it was moderately busy with mainly hotel guests. Details: for more information, visit Sophie’s Café. If you enjoyed this article, you may like these reviews.